Quest Mont Albert offers a range of 1 and 2 bedroom, fully equipped apartments and is ideally located to the Box Hill business, medical and hospital precincts. Our property is well located for those on business or leisure in Box Hill, Blackburn, Camberwell, Canterbury, Doncaster, Ringwood, Burwood, Balwyn and the surrounding Eastern suburbs of Melbourne. Melbourne's famous tram network connects Quest Mont Albert to the CBD via Kew and Richmond - a direct and convenient route. The train station is only minutes away and the trip to the CBD only 15 minutes. The apartments at Quest Mont Albert have a strong appeal to families as they provide facilities such as a fully equipped kitchen, private laundry and spacious lounge/dining area. Our apartments offer all of our guests a home away from home'. Modern, spacious 1BR apartment with full kitchen, laundry and separate living area. With FOXTEL, stereo and DVD, wireless highspeed internet. Includes complimentary undercover parking and use of the gynamsium. Modern, spacious 2BR apartment with full kitchen, laundry and separate living area. With FOXTEL, stereo and DVD, wireless highspeed internet. Includes complimentary undercover parking and use of the gynamsium. Conference room for up to 20 in boardroom style broadband internet connection fax photocopying. Our receptioin desk is open from 7.00am till 11.00pm daily. In the event you are arriving after 11.00pm please advise us at the time of booking so that we can make arrangements for the night manager to let you in. Two bedroom family apartments can accomodate up to 6 guests. Adults will incur a charge $30 per person per night. Children are free of charge for up to permitted number of guests per room. 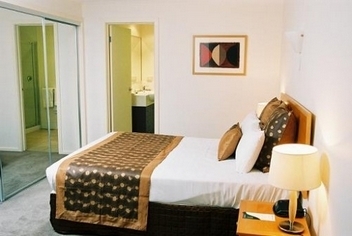 Quest Mont Albert is located on the doorstep of Box Hill and Mont Albert's cultural and entertainment centre. Quest Mont Albert 's prime location in the area means just a stroll to shops, Al fresco cafes, restaurants, markets and food halls.